Julie Greene, neighborhood nemesis of the Gladstones in The Reunion, is back with her own story - before and after her icy "baptism" in the creek. Julie’s meanness was penetrated that day, but what could God do with an insecure, jealous, universally disliked bully? On a rainy summer afternoon, seven children have gathered around “Grandma Greene” to hear a story - the story of just what God could do with that backyard bully in the years that followed. Why don’t you come along? 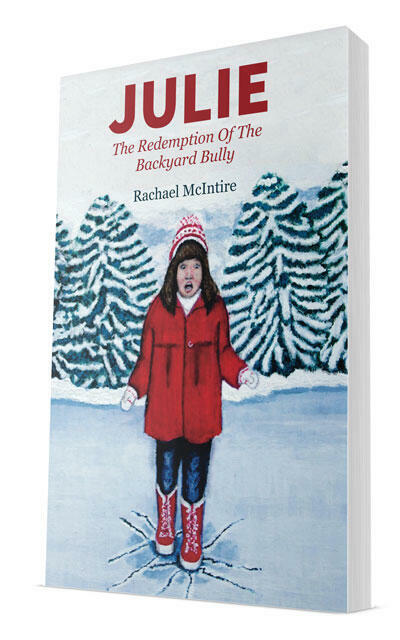 In order to download the digital edition of Julie: The Redemption Of The Backyard Bully for your e-reader, please register free using this form. You will receive an activation email with a link to click for access to e-book downloads, plus early notice when new titles come out. You can unsubscribe at any time, and we will never spam you or share your information. Years ago, Rachael McIntire began writing stories for the homeschooled children in her life. Though these readers are now grown, she sill finds time to turn out a new tale occasionally. Her stories, often incorporating incidents from her own life, are designed to teach biblical principles in an entertaining way. You are not currently logged in. Log in here, or subscribe free.